Dale Chavez Calf Roper Saddle- call 800-888-8721 for lowest price. Acorn tooling. Rough-out jockey. #115 conchos. Chocolate leather. Shown with rawhide/silver laced cantle. 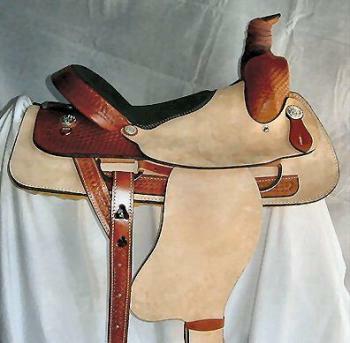 Dale Chavez Roper Saddle- call 800-888-8721 for lowest price. Acorn tooling. #120 S/S conchos. Chestnut leather. Shown with rawhide/silver laced cantle. 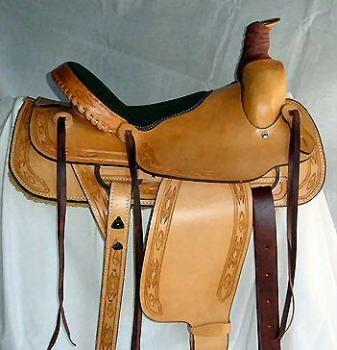 Dale Chavez Roper Saddle II- call 800-888-8721 for lowest price. Basket/floral tooling. #120 conchos. Shown with rawhide/silver laced cantle.